The Myxoling is a adhesive-based Borderling. It resembles two grotesque monsters conjoined together with cords of sticky and flexible membranes. The membrane that connects the two bodies have hues of bright colors, and it varies between each individual. Although the siamese-twin Borderling shares the same body, they have prominent differences. The brightly colored substance protrudes from its back and lower-half. The same sticky substance leaks out from the Borderling’s two mouths in sticky threads. Its body is greyish-white and has the consistency of soft dough. It has a total of six legs, three on each separate bodies. Strong stubby knobs, similar to toes, prop up the Myxoling’s bulky legs. The Myxoling’s heads vary with each individual, and will always have a snout and large, bulbous eyes. 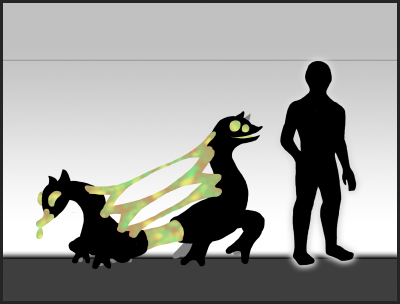 The Myxoling’s body, if flattened, can reform itself within 30 seconds but with minor alternations. Adhesive remover will have an acidic effect on the Myxoling. Its entire body will dissolve into a chunky wet pile after 2 minutes of exposure. Its corpse will blacken completely within 4 days. The Myxoling makes incoherent vocal patterns along with fast, rhythmic chewing noises. Although the Borderling’s voice sounds humanlike, it isn’t capable of forming words or sentences. An impure Myxoling will have a softer body and is more vulnerable to assault. The corrupt Borderling will have a slower rate of regeneration than its healthy counterparts. If one half of the Myxoling is impure and the other half is pure, the corrupt half will get overwhelmed and will die shortly after. The Myxoling appears in places where glue, gum, and other adhesives are present. Hardware stores, gas stations, warehouses, schools and offices will have sighting of this Borderling. The Myxoling travels to and from out dimension through used adhesives. A blob is colorful goo will grow out from between walls and ceilings. It will form into a small, colorless worm. Shortly afterward, it swells and forms into the conjoined Borderling. On rare occasions, 2 or 3 Myxoling will appear in this fashion. They will eat away their mound afterward, fueling their energy to produce sticky slime from their toes and mouth. When it's time for the Myxoling to head back into the Externus, it feeds off of its own webbing. Any leftovers will be eaten by other Myxolings. The remains will blacken and crumble after a day had passed. After consumption, it shudders as its body swells up once more. The Myxoling will form into a large wad of sticky goo, all limbs sink inside its own growing mass. The gummy blob will melt back into the ground, leaving black spots behind. The Myxoling displays different behaviors for each head. Each individual shows different personalities, but all heads will share an hungered, eager disposition. It walks with slow, trudging steps, leaving paths of multicolored goo behind. It can go forwards for backward, but rarely sideways. The dominant head will always lead. The Myxoling will leave parts of itself underneath chairs, tables, and on sidewalks. These secretions act as landmarks and territorial spots for other Myxoling. Biting down with its teeth, it will knead and pull at its own gum as a form of satisfaction. The Myxoling’s hunting habits are very similar to that of spiders. Rats, lizards, and other small animals form the Myxoling’s diet. The Myxoling will use its sticky substance to create webbing around places where it finds food. Once it forms a strong enough web, it waits nearby. Whenever prey gets trapped in a web, the Myxoling will use its trunk-like head to fill the other’s body cavity with glue. It will mutate its prey into a wad of sticky red gum from the inside-out. The Myxoling will then devour its meal. If well fed, both halves of the Myxoling will undergo a transformation. Both halves will grow larger, gaining spiny armor and bulk similar to muscle mass. This ‘mature’ stage will make the Borderling become less sluggish and will provide more energy to find another Myxoling to attach to. On rare occasions, 10 Myxoling will join together into one collective, creating a chaotic bubbling form. If desired, each body will separate into pairs to find more Myxoling. Impure Myxolings will fight amongst each other for health and dominance. If a completely pure half of the Myxoling overwhelms the other, It will gain a solitary mature and form a singular body. It’s rare to find a Myxoling with back legs and a tail. The Myxoling will find new partners of the same kind to attach to. If they fail to separate from their impure halves, however, the pure half will succumb to corruption and revert back from its mature stage. Being impure won’t allow the Myxoling to transform once again. The Myxoling has a weak effect radius, about 1ft (304.cm) in diameter. Within its vicinity, the Borderling will affect the molecular structure of every surface. A touch from a single toe will turn metal, wood, and anything solid into a sticky gum. Witnesses will see multicolored gunk seeping through the cracks of walls, floors, and ceilings. The Myxoling relies on its razor-sharp teeth to spread its effects further out. After biting flesh, the affected area will soften into a thick, sticky paste with the same coloration as the Borderling. The infection will soon transform into glue and has to be treated immediately. By cutting an inch of the Myxoling’s white flesh and applying it to the affected skin, it will absorb the glue around it, leaving normal flesh behind.